"... One of the most inventive, memorable events of the 135 we presented... engaging children and adults equally in a magical world... its singular joy, delight, and insight must be experienced..."
Glimpse Paris inside-out through the eyes of Henri Rousseau as ready maids parade the Champs Elysees, zoo animals float out of their cages and into a garden of pink leaves, a bicyclist climbs the Eiffel Tower, in a journey that discovers the joy and responsibility of invention. 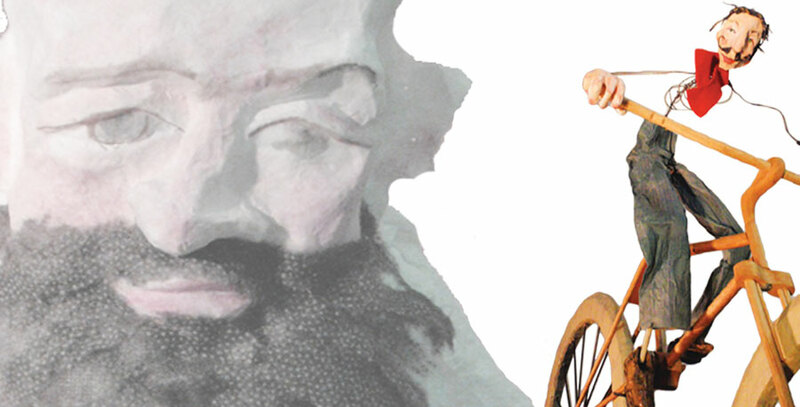 Using puppets, dance, and lyrical storytelling, Sebastienne Mundheim along with collaborating visual and performing artists, celebrate turn of the century Paris and the avant-garde. Thirty minutes of performance and sixty minutes of hands-on workshop. Appropriate for all ages and languages. 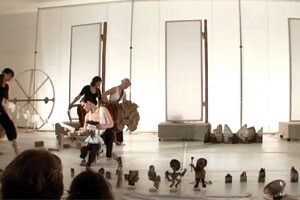 Originally commissioned by the Kimmel Center for the Performing Arts, Paris Wheels and the Ready Maids was performed to enthusiastic, sold-out audiences for its premiere run at Philadelphia International Festival of the Arts (PIFA) 2011. Appropriate for small theatres, gallery spaces, atrium-spaces. Sound: One Vocal Microphone, 2-4 speakers, computer and cables. Paris Wheels and the Ready Maids … was originally conceived as part of a larger education program that included in-depth hands-on workshops in visual, literary, performing, and media arts. While the performance is a wonderful experience on its own, follow-up workshops allow viewers to explore the themes and concepts introduced in the performance in much greater depth. These workshops can range in length from one session to twenty sessions. They can be tailored for teachers, students, performing arts groups, and topic-specific groups. Through workshops in sculpture, puppetry, movement, and storytelling we can address many content areas. Techniques include: object theatre, puppetry, and movement. All performers are experienced educators in elementary-graduate level teaching. Originally commissioned by the Kimmel Center for Performing Arts for the Philadelphia International Festival of the Arts 2011. Special Thanks: Kimmel Center for the Arts, Jay Wahl, Amy Harting, Emogene Schilling, Jason Burnham, Crane Arts Center, Richard Hricko, Dave Gleason, Nick Kripal, Jamie, Stephen Shuster, Mike Riggs, Walking Fish Theatre, Stan Heleva, Piccadilly Arts, Chrissie DiAngelus, Jim Casey, Pig Iron Theatre Company, Louis Jargow, Bronwen MacArthur, Mike Riggs, Andrea Campbell, Chrissy Day, Cat Yard, Amber Martin Leister and, of course, the whole cast.